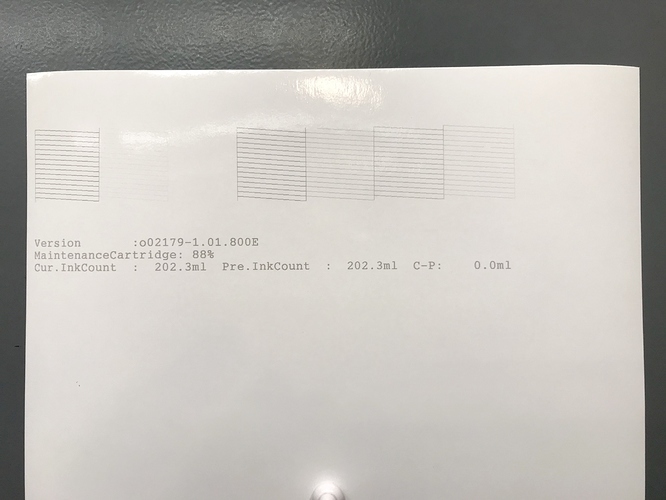 This is our first day printing on Pictorico after having installed PPE v.2 and Quad Tone RIP 2.7.8 on our school’s iMac running macOS Sierra 10.12.6 and usb connected to an Epson 3800 printer with freshly installed Piezography K7 HD/PiezoDN, Selenium tone inks. Any help you can offer on the following issues would be appreciated! our initial nozzle check looks suspect; there is no visible ink in the 3rd section and hardly any visible ink in the 8th section. Reinstall? 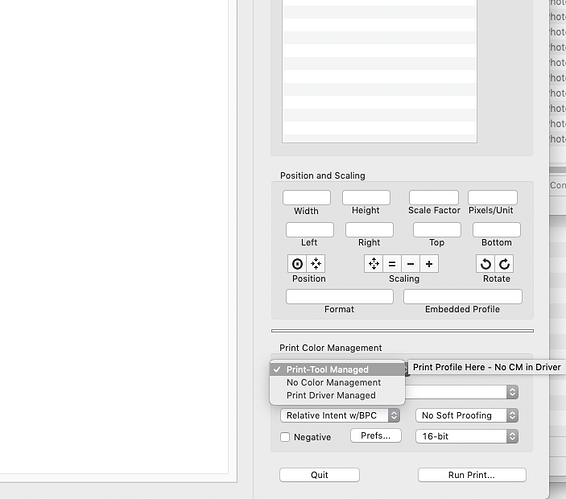 once the image is loaded in Print Tool from Photoshop, the dialogue box at the bottom right only offers “Application Managed”, not “Print Tool Managed”. -We’re using Piezo DN_PtPd default as the output profile and “perceptual”, so no issues here. -Our Printer is “Quad3800-K7”, format for Quad 3800 Piezo DN Pro, Curve #1 is Piezo DN Pro-Master-beta. Is this an appropriate work flow? 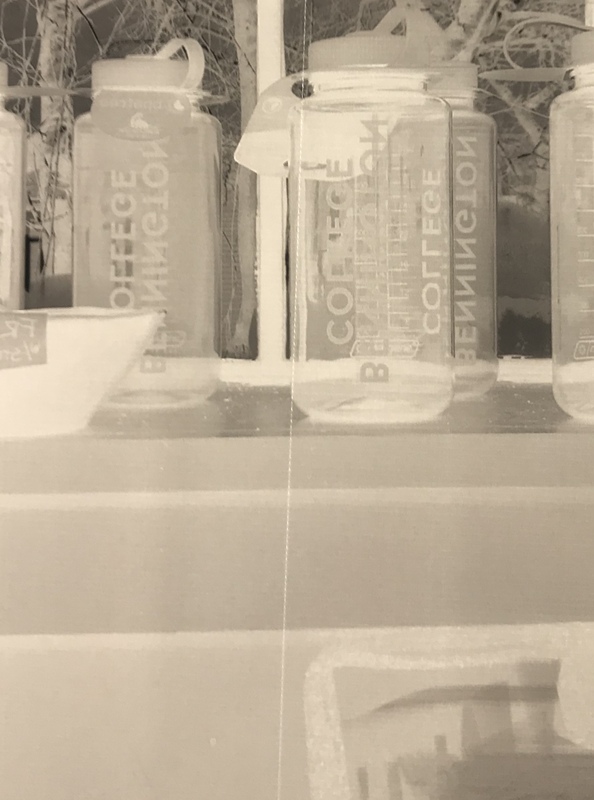 The first negative came out without difficulty but I don’t want to proceed until I get the above issues straightened out. Thanks so much! One ink is gloss optimizer. Print a nozzle check on gloss paper and look at the glare reflected off a lightbulb. You will see the nozzles show up. Not sure about the 8th section. Can you upload your nozzle check? Wrong curve folder. After installing PiezoDN go to Piezography>Curves>3800-3880-PiezoDN and run the 3800 install command there. Thanks Walker for responding to my questions. Hopefully you’ll be able to discern from the attached nozzle check on glossy paper whether we have all K7 selenium inks engaged properly or if some are misfiring. 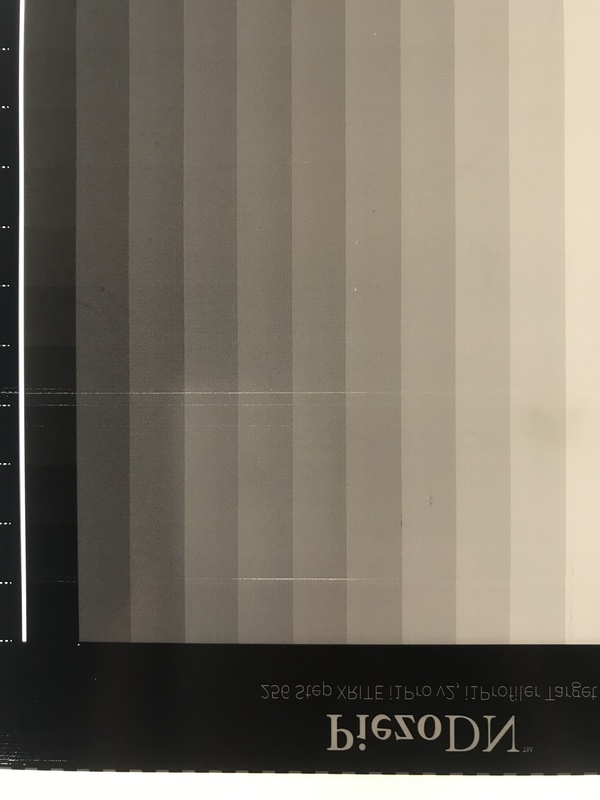 Bouncing direct light off of the 3rd square does indicate some faint trace, but isn’t the 8th square from the left supposed to be darker? All seven shades and the GO are in the correct positions. 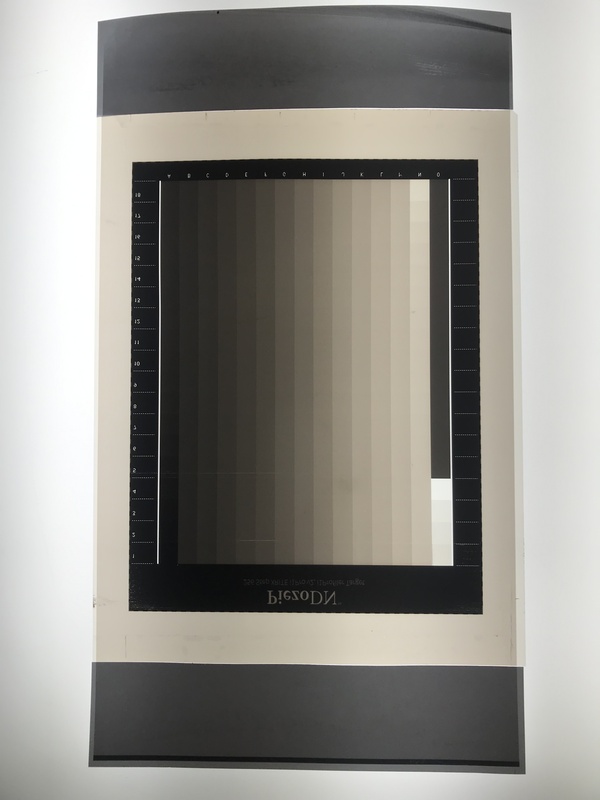 It’s really hard to see shade 7 in the yellow position in this photo. There are a few nozzles missing here and there… You can easily see shade 7 when you run a Calibration Mode test (in the manual). But, from what I can see the inks are properly placed.
. Color Port can’t read Colormunki. Is there anyway around this or does the school have to purchase i1Pro before we can proceed here? Thanks. ColorPort is no the app you need. You need ColorPicker. If memory serves, you have this installed in your computer. The school’s photo dept. is considering improving our ability to calibrate monitors and printers by purchasing this i1Photo bundle. So far we’ve been trying to get by with a 10 year old Color Munki spectrophotometer, very frustrating. In your opinion is this the optimum X-Rite tool out there for under 2K that would meet our needs for Piezography DigiNegs as well as routine monitor/printer calibration? Yep. This is what you want. It pays for itself in less ink/paper/time being used re-printing. 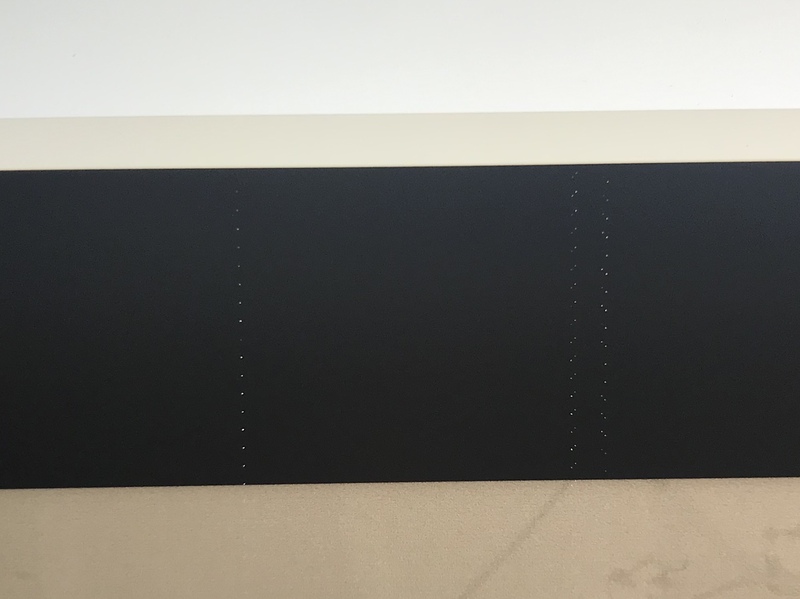 Epson 3800 printer: it has a clear vertical line running down each digineg we print, even after cleaning the head and pad with piezoflush. Any thoughts? Are you printing with the star wheels raised? If so, then this could be a dirty encoder strip that needs cleaning. Or there is something stuck in the platen area of the printer that is dragging on the film. Thanks, after a careful cleaning our tech was able to remove the schmutz on the platen. However, we are now encountering pizza wheel roller marks on the Pictorico material, not so visible in the image area but definitely along the edges where ink deposit is heaviest. Any thoughts on how best to correct this? We’ve reset the platen distance to “wider” in Photoshop but can’t find any dialogue boxes in QTR to do the same. Click that link on my post above. 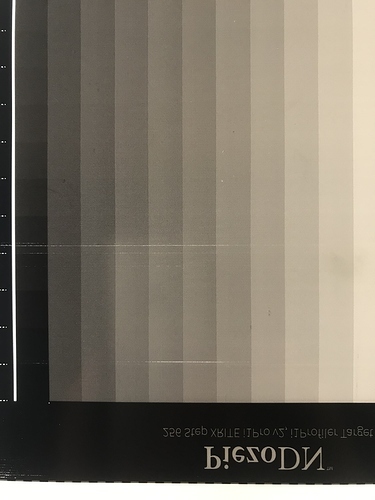 If our photo tech is unable to perform Keith Schrieber’s trick of raising the wheels, would it be possible to schedule a day to have Dana properly clean/raise wheels on this Epson 3800? I could drive it over. We’ve lost the past three weeks of printing Pictorico due to problems that our new tech isn’t able to overcome. Yeah, sure, come on by! I can do it. It will only take about 20mins. We do charge labor fee for it. Give us a call before coming. M-Thurs 10am-4 is when we are available. Our tech is trying her hardest to eliminate the pizza wheel issue, but they are still visible. Is there a way I could drive over tomorrow, 3/21 Thursday, and have it looked at? I would get there by 11am if that works for you. 11am tomorrow works fine. I’ll put it on my schedule. Sounds to me like either the tech is not following the procedure in my article which lifts the star-wheels so that they do not contact the film, or the problem is due to something other than the star-wheels. It’s really not a difficult procedure. By the way, I know that 99% of us (a statistic I just made up) refer to those little things as pizza-wheels, but a pizza wheel shaped like that would do a lousy job of cutting pizza. A pizza wheel is a round knife with a smooth edge. In the service and repair manuals, Epson calls them star-wheels, as in the points of a star. I think of them as spurs. We figured it out in person. The tech had maneuvered the top platen (star wheels) rack into a skewed state. Just reset it and did a few mods and tested and it’s a’ok. 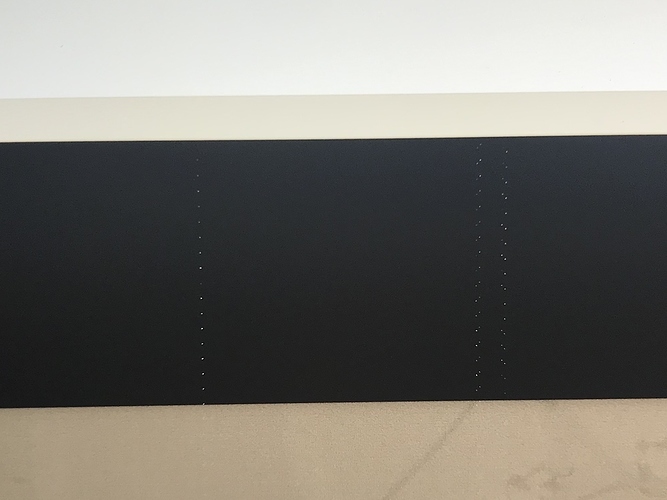 So, we’ve taped two pieces of glossy paper measuring 2x8.5 inches on each end of the Pictorico, created a canvas size of 8.5x 15 inches and we’ve eliminated the star wheel issue but now have these random gash lines running perpendicular to the paper feed axis. Does the platen need cleaning?